2010-03-03. New. Ships with Tracking Number! INTERNATIONAL WORLDWIDE Shipping available. Buy with confidence, excellent customer service! 2005-06-21. New. Ships with Tracking Number! INTERNATIONAL WORLDWIDE Shipping available. Buy with confidence, excellent customer service! Random House Large Print, 2010-03-23. Lrg. Paperback. Used:Good. 2005-09-09. New. Ships with Tracking Number! INTERNATIONAL WORLDWIDE Shipping available. Buy with confidence, excellent customer service! 2005-05-02. New. Ships with Tracking Number! INTERNATIONAL WORLDWIDE Shipping available. Buy with confidence, excellent customer service! Random House, 2005-06-21. Hardcover. Used:Good. 2010-03-03. Good. Ships with Tracking Number! INTERNATIONAL WORLDWIDE Shipping available. May not contain Access Codes or Supplements. May be ex-library. Shipping & Handling by region. Buy with confidence, excellent customer service! 2005-06-21. Good. Ships with Tracking Number! INTERNATIONAL WORLDWIDE Shipping available. May not contain Access Codes or Supplements. May be ex-library. Shipping & Handling by region. Buy with confidence, excellent customer service! New York: St. Martin's Press. As New in As New dust jacket. 2005. First Edition; First Printing; Signed by Author. Hardcover. 0312306261 . A beautiful first edition, first printing in As New condition in alike dust-jacket, SIGNED by author Janet Evanovich directly on the title page; Stephanie Plum quits, resigns, no looking back, and no changing her mind as she wants something safe and normal. She takes an office position in security, working for Ranger, the sexiest, baddest bounty hunter and businessman on two continents. It might not be the job shell keep for the rest of her life, but for now . St. Martin's Press. MASS MARKET PAPERBACK. 0312985347 New Condition. . New. Random House Large Print. PAPERBACK. 0739377485 New Condition. . New. Random House. Hardcover. 0375435336 New Condition. . New. 2005-09-09. Good. Ships with Tracking Number! INTERNATIONAL WORLDWIDE Shipping available. May not contain Access Codes or Supplements. May be ex-library. Shipping & Handling by region. Buy with confidence, excellent customer service! 2005-08-02. Good. Ships with Tracking Number! INTERNATIONAL WORLDWIDE Shipping available. May not contain Access Codes or Supplements. May be ex-library. Shipping & Handling by region. Buy with confidence, excellent customer service! 2005-05-02. Good. Ships with Tracking Number! INTERNATIONAL WORLDWIDE Shipping available. May not contain Access Codes or Supplements. May be ex-library. Shipping & Handling by region. Buy with confidence, excellent customer service! NEW YORK: ST MARTINS PRESS, 2005. 1ST EDITION 1ST PRINTING. HARDCOVER. FINE/FINE. NEW YORK: ST MARTINS PRESS, 2005. 1ST EDITION 1ST PRINTING. FINE/FINE. SIGNED BY AUTHOR. St. Martin's Press, 2005. Hardcover. Book Condition: Fine. 0312306261 Author Signed Hardcover Book. 2005 NY: St. Martin's First edition, first printing, fine in a fine dust jacket, signed by author, NOT remainder marked. Each dust jacket is protected in an acid-free archival quality acetate cover. SIGNED only, no inscription on title page. Unclipped DJ. Macmillan Audio, 2005. CD-Audio. New. 5.78 x 5.4 cm. New York: St. Martin's Press. Near Fine in Near Fine dust jacket. . First Edition; First Printing; Signed by Author. Hardcover. 0312306261 . An eye-catching first edition/first printing in Near Fine condition in alike dust-jacket with light edgewear. SIGNED by author on a tipped in leaf; Stephanie Plum quits her job as a fugitive apprehension agent. Deciding that she wants a safe and normal position, Plum thinks she has found just that when she begins a new position at a security firm, but she quickly finds out otherwise. Her new boss Ranger is the baddest bounty hunter and businessman on two continents, and Plum realizes that the trouble she had at the bail bonds office doesn't even come close to the kind of trouble she finds herself in now . New York: St. Martin's Press. 2005. First Edition; First Printing. Hardcover. 0312306261 . Very Good+ in a Very Good+ dust jacket. ; Signed and dated by author. ; 1.2 x 9.1 x 6.4 Inches; Original unclipped dust jacket protected by archival Brodart cover. All domestic orders shipped protected in a Box. ; Signed by Author . 2005-04-05. Good. Ships with Tracking Number! INTERNATIONAL WORLDWIDE Shipping available. May not contain Access Codes or Supplements. May be ex-library. Shipping & Handling by region. Buy with confidence, excellent customer service! U.S.A.: St. Martin's Press, 2005. 1st Edition 1st Printing. Hardcover. As New/As New. Cecil Beaton. A fine copy in a fine unclipped dustjacket. Signed by the author (Signature only) on the title page--as new condition--fine tight and clean copy protected in an acrylic dustjacket covering. Random House Large Print. PAPERBACK. 0739377485 Like New Condition. . Fine. New York: St. Martin's Press, 2005 First edition first printing signed on prelim: "Janet Evanovich" with black pen. 8vo. Blue boards stamped in metallic blue on spine. 310 pages. Dust jacket. Like new/ Like new. .
St. Martin's Press. MASS MARKET PAPERBACK. 0312985347 Like New Condition. . Fine. Random House. Hardcover. 0375435336 Like New Condition. . Fine. Random House Large Print, 2010-03-23. Paperback. Good. St. Martin's Press, 2005-06-21. Hardcover. New. Excellent condition. Interior is tight, bright and clean. Hard covers are tight and show signs of light shelf wear. Minor scuffing and edge wrinkles on the paper dust cover. 100% Satisfaction Guaranteed. All items are carefully enclosed with bubble wrap. We ship promptly and worldwide via US Post and will email you a tracking number. St. Martin's Press. Hardcover. 0312306261 New Condition *** Right Off the Shelf | Ships within 2 Business Days ~~~ Customer Service Is Our Top Priority! - Thank you for LOOKING :-) . New. Gordonville, VA, U.S.A.: St. Martin's Press, 2005. Book. Fine. Hardcover. Signed by Author(s). 1st Edition. Condition: Fine. Brand new. SIGNED in ball point ink. Signature on front endpage. No visible wear. No clipping. Format: Hardcover, Series: Stephanie Plum Novels Ser., Number Of Pages: 320 pages, ISBN-13: 9780312306267, Publisher: St. Martin's Press, ISBN-10: 0312306261, Language: English. Fiction. .
N. Y.: St. Martin's Press, 2005. Hard cover is in fine condition as is the dust jacket. Is a stated first edition, first printing. Is A Nice Copy !!!. First Edition. Hard Cover. Fine/Fine. New York: St. Martin's Press, 2005. SIGNED by the AUTHOR on the Title page. Signature only First edition, First printing. Book is in Very Good + condition. Boards are clean, not bumped. Fore edges have a small amount of reading wear. Interior is clean and legible. Not remaindered. Dust Jacket is in Very Good + condition. Tiny bit of edge wear, tiny bit of crinkle. Not price clipped. Dust Jacket is covered by Mylar wrapper. Thanks and Enjoy. All-Ways well packaged, All-Ways fast service.. Signed by Author. First Edition. Hard Cover. Very Good +/Very Good +. Gordonville, VA, U.S.A.: St. Martin's Press, 2005. Book. Fine. Hardcover. Signed by Author(s). Condition: Fine. Brand new. SIGNED in ball point ink. Signature on front endpage. No visible wear. No clipping. Format: Hardcover, Series: Stephanie Plum Novels Ser., Number Of Pages: 320 pages, ISBN-13: 9780312306267, Publisher: St. Martin's Press, ISBN-10: 0312306261, Language: English. 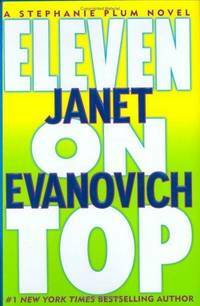 Fiction. .
Eleven on Top (A Stephanie Plum Novel). New York: St Martins Pr, 2005. Book. Fine. Hardcover. Signed by the author on the title page.. First Edition/First Printing. A square csolid tight carefully read copy. This copy has just a hint of pagedge soil else fine. The priced jacket has some light rubbing wear else fine. This copy includes a program/signing directions from the signing event and and a picture of the author that I snapped at the signing event. THIS IS IN MY POSSESSION AND WILL NORMALLY SHIP NEXT DAY..
St. Martin's Press, 2005-06-21. Hardcover. Like New. Looks New! St. Martin's Press, 2005-06-21. Hardcover. Very Good. Nice looking book, has edge wear. NEW YORK: ST. MARTIN'S PRESS. VG/VG DJ IN MYLAR WRAP. FRONT HINGE CREAKS. Pages: 310. . 2005. 1ST. HARDCOVER.. Condition: VG/VG DJ IN MYLAR WRAP. FRONT HINGE CREAKS. Pages: 310. Various Publishers. MASS MARKET PAPERBACK. B000KGK022 . New.